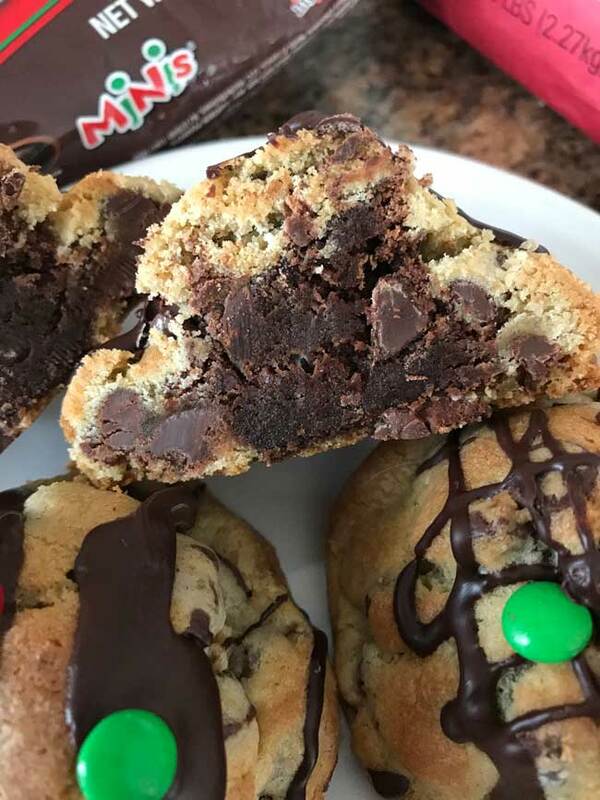 Therese sent this recipe for Chocolate Chip Brownie Pillows after finding it in an ad for the upcoming Southern Living Christmas edition. The cookies are interesting, fun, and substantial enough to be wrapped individually for gift giving. And by the same token, I think they’d be perfect for bake sales. For the sake of convenience, I used brownie mix brownies, but you could just as easily use leftover brownies from another recipe. Update: I make a ton of brownies, and this recipe comes in handy when I need to use the leftovers. Over the years I’ve questioned whether the dough really needs to 2 teaspoons of baking powder. It seems the baking powder lightens the cookie and gives it a softer texture (hence the “pillow” name). I can’t decide whether I like the brownies hidden within the cookie or plopped on top of the dough. Here’s a picture of how the cookies look with a brownie hidden inside. 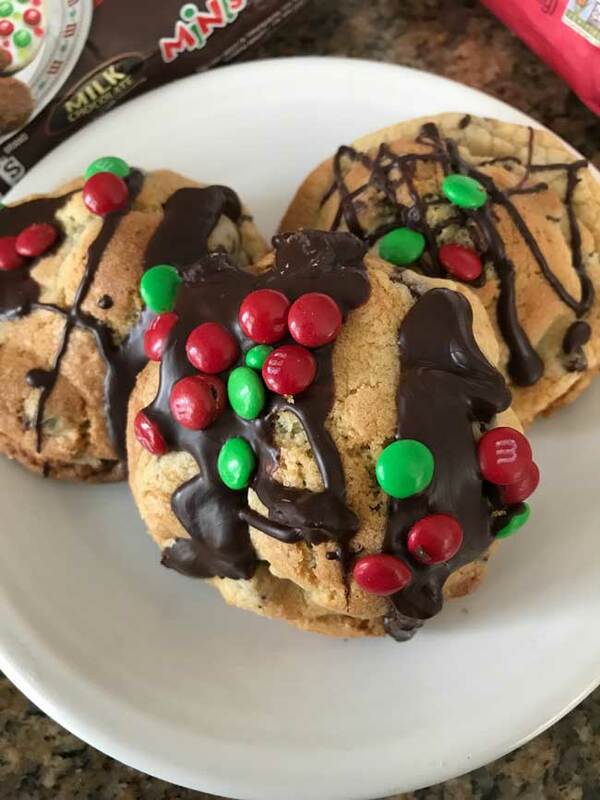 I drizzled this one with melted chocolate chips and sprinkled it with Christmas colored candies. Prepare and bake brownie mix according to package directions in an 8' square pan. Cool completely, then cut brownies into about 3 dozen squares. You’ll only be making 11 giant cookies so you don’t have to cut all the brownies. Beat butter and shortening at medium speed with an electric mixer until creamy. Add brown sugar, beating until smooth. Add eggs, egg yolk, and vanilla, beating until blended. Combine flour and next 3 ingredients; gradually add to butter mixture, beating just until blended after each addition. Stir in chocolate morsels. Cover and chill dough 1 hour. brownie square in center. Press chocolate chip dough around brownie; reshaping dough to form a ball. Repeat procedure until remaining dough and 10 brownie squares, placing no more than 6 cookies on a baking sheet. Chill for 15 minutes. look set. Cool 2 minutes on baking sheets; remove to wire racks, and cool completely. Yield: 11 jumbo cookies or 22 smaller but still very big cookies. Alternative: Do not wrap the dough around a brownie. Instead, bake the cookies for about 15 minutes or until they are almost but not completely baked. After 15 minutes, quickly stick a brownie square in the center. Continue baking for 3 to 5 more minutes. You can also make the cookies half the size, in which case you stick the brownie piece in after 12 minutes and only cook for 2-3 more minutes. Or you can make slightly smaller cookies and hide the brownie piece. For smaller cookies, use about 1/3 cup of dough per cookie. I've been making these for a while now (they're great for using leftover brownies), but I almost always make them smaller. I use a large cookie scoop which is equal to about 1/4 cup and bake the cookies for about 15 minutes. I also like to stick the brownie in at the end and then drizzle chocolate over the top. I haven’t made these in a while and don’t remember if I used butter flavor or regular. However, I can see why you’d think that. Sometimes the butter flavoring in the BF Crisco can taste a little overwhelming. I have a few cookies where I’ve used it and regretted it. However, in some cookies the artificial butter flavor blends in or adds flavors people perceive as buttery. what kind of shortening do you use in these cookies? I tried butter flavored crisco in cookies before but they tasted disgusting. I lost this recipe a few weeks ago and am so glad I found it here! I’m keeping my fingers crossed that I can actually make these because these really are the most divine cookies ever. These cookies are driving me crazy — in a good way! They are a “must try” for next time I need to bake a batch for a group gathering. I think I’ll use the Ghirardelli triple chocolate brownie mix in mine. Can’t wait!!!! 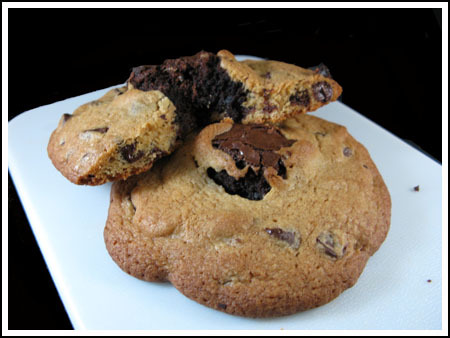 Wow, brownies and chocolate chip cookies rolled into one. You are so right about these being a bake sale best seller! wow that looks like absolute heaven!! Oh my goodness I want to sleep on these pillows! Gina, that is too funny! Thanks for the comments, everyone. I can’t answer them all right now so I’m just going to answer the questions. Erin, the brownies stayed soft. I used brownie mix and baked it in an 8 inch pan so the brownies started off very tall and soft. They stayed that way. Therese, thanks again for the recipe. I have to admit, I used store brand brownie mix and the cookies were still great. Now that I know they’re good, I’ll use better brownie mix. Emily, thanks for the “beautiful” remark. They look even better in real life. Also, I didn’t chill my dough very long so I think when I bake up the next round using very cold dough, the cookies will look better. But overall I’d say they’re solid bake sale fare and are cute. Ok, we have been on tha same wavelength before, but this is getting TOO WEIRD! My officemate’s dear little 84-year-old mom, who is a terrific baker, sent me the BEST cookie yesterday via her daughter who left it on my desk at work. After one bite of the ginormous thing, I knew I wanted to make more right away. However, I have no time for anything other than pies at the moment (teaching another workshop at school tomorrow). But I thought, this is right up Anna’s alley–I should send her the recipe. 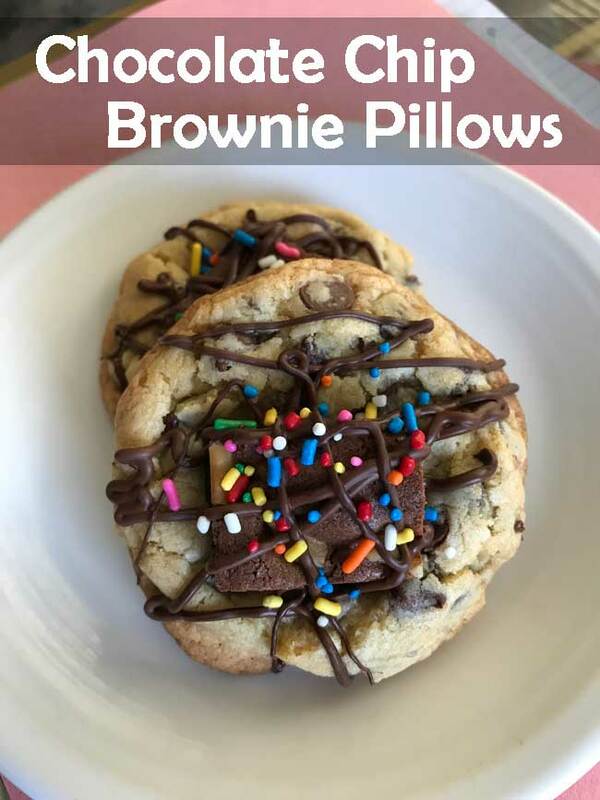 So I signed onto to your site to post the suggestion, and what should your cookie o’ the day be but the same Chocolate Chip Brownie Pillows that I was going to send you! WEIRD! Wow, I feel so honored!! Thanks for posting the recipe. They really are great! And if you use the Girandelli…OMG…OVER THE TOP flavor! This will be one of keepers for sure! Yippee, Ms. Ginsberg made a recipe o mine!! Wow. Wow. I am gobsmacked! This may be the ultimate bakesale/gift cookie. 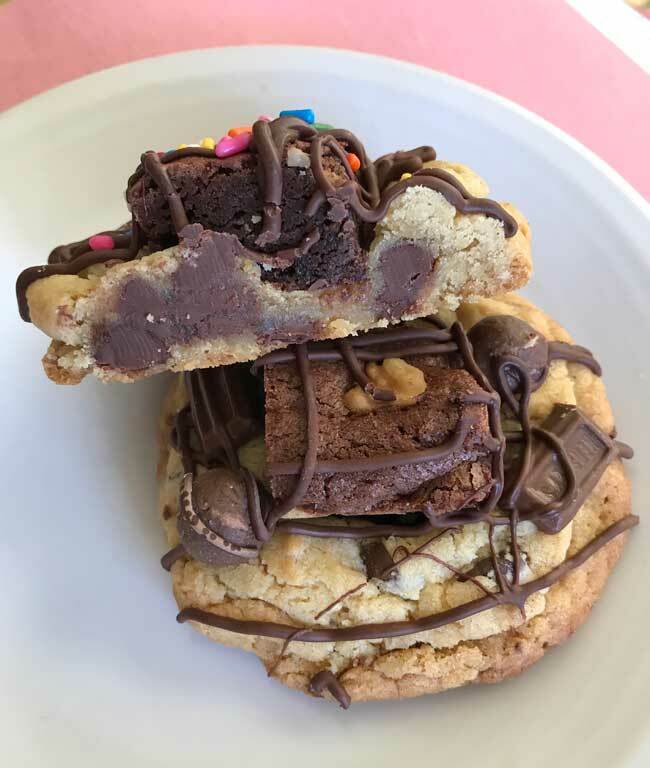 I’m starting to think more evil thoughts–a chocolate chocolate cookie with a blondie in the center? Or a peanut butter cookie with a blondie in the center…this is true cookie madness at its finest! OH. MY. Definetely not a good thing to see while low carb-ing & pms-ing. Yum, these look great. Not sure if I made them they would ever get to a bake sale. Cookies like this are fun. After making last week’s TWD Chipster Topped Brownies (ccc on top of brownies), I decided I’d rather have a brownie in one hand and a ccc in the other. I’ve made little balls of brownie before, froze them, then baked them in a ccc. This looks like a fun way to bake in the middle! to clarify that was an excited/incredulous exclamation. I’ve never seen something so beautiful. I’m curious, do the brownie pieces get crunchy getting baked that extra time?